Oh, how soon we forget. LED watches seem to be all the rage recently, with a sudden flood available in the sub-$100 range. Let's take a quick look at another market segment that died a quick death in the mid 1970s. 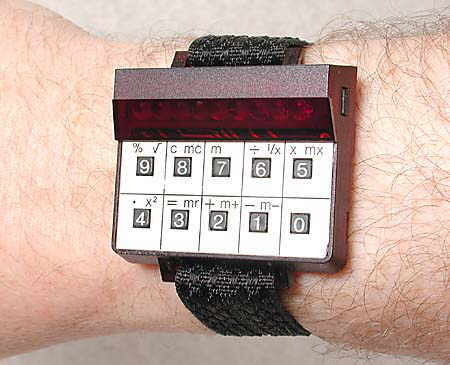 Pulsar was first out of the gate with an LED calculator watch in 1975, followed in 1976 by models from Compuchron (above), Uranus, and even HP. 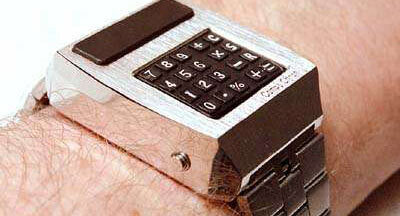 The strangest of all was the 1977 Wrist Calculator from Sinclair (right) -- it didn't include a built-in watch. Apparently, you were supposed to lug it around on your wrist while searching for people in need of emergency arithmetic. Like their watch-only brothers, these little counting machines chewed through batteries so quickly that the display could remain on for only a few seconds at a time. The Compuchron's boxy metal housing hides four largish button cell batteries that provide the electrons for its careful pondering. Lets hope some enterprising Chinese firm isn't gearing up to churn out remakes of these - it was bad enought the first time. They're occasionally available on the second-hand market as "new old stock" -- the technology developed so quickly that many units were left unsold. Write-ups for the 1989 Atari Portfolio always describe it as "about the size of a VHS tape." Not much help in our tapeless world. These days, we'd have to compare it to a stack of DVDs or a half-dozen iPhones. 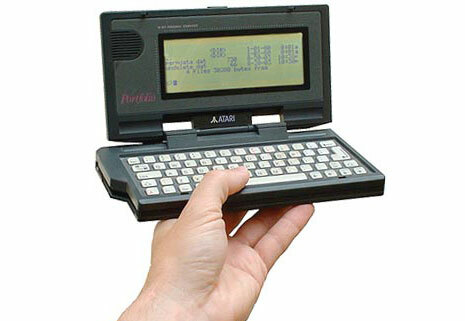 The Atari Portfolio was a marvel of late 1980s miniaturization. Designed by DIP in Guildford, UK, it was more-or-less IBM-PC compatible. The biggest compatibility challenge was the monochrome 40x8 character non-backlit screen -- few programs could run acceptably with so little screen real estate, and even fewer developers produced Portfolio versions of their work. The machine featured an NEC V30 processor (Intel 8088 clone), a meager 128K RAM, and a Microsoft DOS 2.2 compatible operating system that was idiotically named "DIP-DOS." There was no room for internal floppy or hard drives so everything was stored in battery-backed memory cards. A special card reader was available to transfer information to your desktop PC. Oddest quirk: When turned off, the screen flashed briefly every couple of minutes as the machine woke itself to check the calendar. The Portfolio was years ahead of its time, but its non-standard design kept it from being easily adopted by the business community. It (and Atari Corporation) disappeared quietly into the mists of time in the early 1990s. The Great Leaping Lambrettinis is an iPhone game inspired by Nintendo's classic LCD Game & Watch series, and we have two promo codes to give away. "The Great Leaping Lambrettinis, a famous italian circus artist family, rehearse their new and daring teeterboard act. However, the coordination among the Lambrettinis has yet to improve. Since they are all involved in the show they for once hire a coach who is not a member of the family but still a world-accepted authority in the realm of the teeterboard: YOU! Now it's your job to assure that the Labrettinis make it to the next teeterborad and not to the next hospital." To enter, leave a comment about a vintage device we haven't mentioned on the site (use the search box in the sidebar to check). The contest closes at midnight EDT on Sunday, October 4th, 2009. Two winners will be chosen at random. 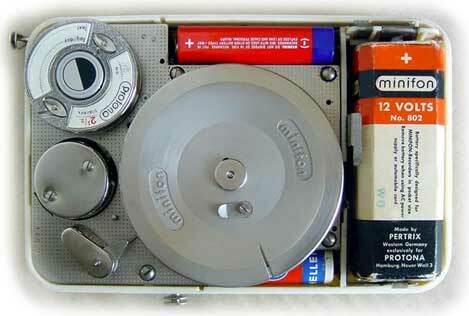 The Minifon Mi51 was the world's first miniature magnetic recorder. The product line was built in Hanover, starting in 1951. Even the USA was not in a position to build such equipment at that point. The Minifon is a wire recorder that incorporates two miniature vacuum tubes . Three different batteries are necessary for operation: one for the motor, along with two to power the vacuum tube heater elements and anodes. 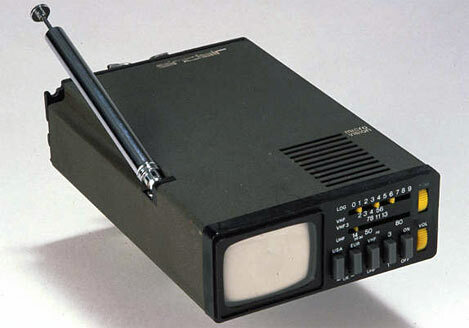 The Minifon measured 17 x 11 x 3.5 cm - about the size of a wallet - and was intended to capture clandestine recordings. Corresponding accessories included a wrist-watch microphone and telephone adapter. The IIHS celebrated its 50th anniversary by crashing a 1959 Bel Air and a 2009 Malibu. The result? A great big, highly educational mess. 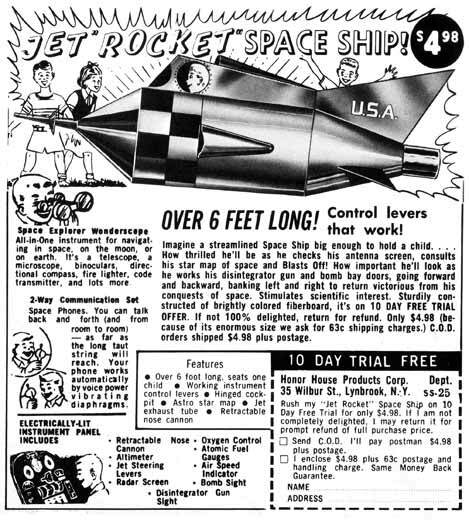 Check out the description of the 2-Way Communication Set in this December 1964 comic book ad: "You can talk back and forth (and from room to room) - as far as the long taut string will reach. Your phone works automatically by voice power vibrating diaphragms." The breakup of the Soviet Union had many unintended consequences. The fabled Russian space program has been one of the most high profile victims of the nation's shift to capitalism. 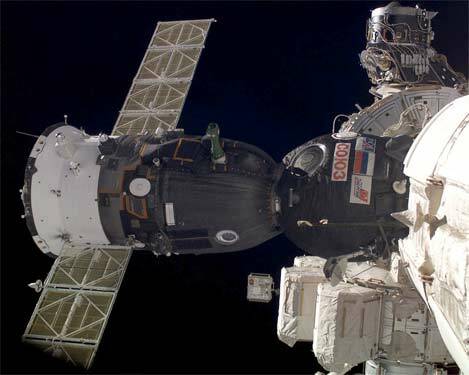 Simon Saradzhyan at Space.com recently wrote, "A career as a cosmonaut—once the dream job of a lifetime for millions in this country—is increasingly less attractive because it is no longer the ticket to international fame or a fortune. As a result, the pool of qualified candidates for positions in Russia’s cosmonaut corps is shrinking." There are currently 37 Cosmonauts on active duty in Russia and each is paid less than 20,448 Rubles (US $775) per month, plus flight bonuses. The Cosmonaut program is still popular with military pilots because it offers a higher salary, but many others opt for more lucrative careers in the private sector. There is one benefit of the reduced competition to become a Cosmonaut. In the past, qualified Cosmonauts sometimes retired without ever flying in Space. The reduced size of the modern space program means that there's a much greater likelihood that participants will get to travel to the ISS, although the current wait time is 10 to 15 years. And you have to admit that riding a rocket into orbit beats flipping even the best of burgers. The German Messerschmitt 262 was the first combat jet fighter. It first flew against the Allies in August of 1944, eventually racking up 509 claimed kills. The project actually pre-dates the outbreak of WWII, with the original plans drawn up in April 1939. Unfortunately for the Luftwaffe, the aircraft was delayed by problems its state-of-the-art jet engines and material shortages. Only about 10 of these historical machines still exist in aviation museums. None are airworthy, nor would it be wise to risk attempting to restore and fly such a rare machine. For many years, it seemed that the world would never again see a flying Me 262. Luckily, a group of American aviation fanatics had other plans. The Me 262 project was founded in 1993 with the aim of building a new series limited to five Me 262 aircraft. So far, the team has completed and flown two aircraft and a third is nearing completion at their Paine Field headquarters in Washington State. The new Me 262 was designed to be as faithful as possible to the original. The most significant change was the substitution of twin General Electric J-85 engines (as used in the T-38 Talon) in place of the failure-prone Junkers Jumo 004 powerplants, which had an engine life of only 10 to 25 hours. To make the plane appear as authentic as possible, the J-85s are built into castings of original Jumos. This helps to maintain appropriate weight and balance in the engine nacelles. Theoretically, the modern engines should allow the Me 262 to fly faster than any previous generation of the aircraft, but the airframe simply wasn't designed for such high speeds. As a result, the design team placed a placarded airspeed limitation of 500 mph on the aircraft. The J-85 is also 40% more efficient than the original engine, giving the new Me 262 a range of approximately 1,100 miles. One other relatively small change was made to the landing gear, since it was in everyone's best interest to make it as reliable as possible. Apart from that, these machines are as close as you'll ever get to seeing the real thing take flight, right down to the four fearsome nose-mounted Mk 108 cannons. One aircraft is currently operational in the USA, with a second registered in Germany. The Neuhaus Laboratories T-2 amplifier is a strange beast. On one hand, it features six vacuum tubes in a push-pull configuration. The signal path is kept clean by eliminating bass and treble controls. However, it also has a newfangled USB input that drives a 44.1 kHz digital to analog converter. But that's not all... there's another TOSLINK optical digital input in case you want to hook up a DVD player. I'm somewhat baffled. If you're going to make a fuss about creating a clean and simple analog signal path, keep it that way. 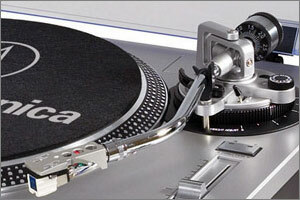 Don't add a couple of DACs because chances are that the converters in your CD and DVD players sound every bit as good. Keeping digital interference away from your glorious tube circuit is far more important. Those criticisms aside, the T-2 is a nice looking amp that offers a handful of old fashioned analog inputs. The $795 list price is reasonable, and I appreciate the inclusion of a genuine ALPS motorized volume attenuator and a basic but functional remote. The piano black glossy front panel is understated and the stainless steel body reflects the plethora of tubes in their best light. You can connect analog devices using three sets of gold plated RCA inputs, and the amplifier is capable of putting out 20W x 2 (presumably into a 4 ohm load). The output transformers are "homemade" (not a marketing term that instills great confidence) and the circuit incorporates slow start power on to avoid damaging your speakers. I only wish they'd release a simplified version without the digital bells and whistles. It would cost less and probably sound better. The Staffordshire Hoard consists of over 1500 breathtaking gold and silver items. It was discovered by treasure hunter Terry Herbert on July 5, 2009. He was searching private land with a metal detector when he came across the first item. Herbert then spent the next five days feverishly scouring the neighbouring farmland in search of the rest of the treasure. The items were subsequently excavated by the Birmingham University Archeology Unit to ensure that nothing was accidentally damaged or overlooked. "The quality of the craftsmanship displayed on many items is supreme, indicating possible royal ownership. Stylistically most items appear to date from the seventh century, although there is already debate among experts about when the Hoard first entered the ground. The exact spot where the Hoard lay hidden for a millennium and a half cannot yet be revealed. However we can say that it lay at the heart of the Anglo-Saxon Kingdom of Mercia." The first question that crossed my mind was, "Does Herbert get to keep it?" It turns out he doesn't - ownership of the find falls to the Crown and the collection will be offered to museums. However, 55-year-old Herbert and the landowner will receive a reward equaling the full value of the treasure, but figuring out how much it's all worth will be tricky. The metal has a scrap value of approximately £100,000, although top-notch 7th century craftsmanship is a tad rarer than gold fillings or old pocket watches. Some of the pieces will be displayed at the Birmingham Museum from Friday September 25th through October 13th. After that, everything will be taken to the British Museum for valuation. Next week, the timeless Technicolor classic "The Wizard Of Oz" comes to high definition Blu-Ray. Promoters are celebrating the event with a special screening in movie theaters September 23rd. Posters and a breathless trailer say that you'll be seeing the movie like never before, and heavily imply that this fresh release of the movie will look better than ever. They rely on the typical consumer not realizing that movie theaters will show the film via digital projection, not celluloid film. High definition projection is only about half the quality of any film print moviegoers have seen in the last seven decades. Projected video can't deliver the breathtaking color of a real Technicolor print. I can accept a lot of things when sprucing up a movie for re-release. By all means restore and repair the visuals from the film. Upgrade the special effects as long as they remain in the spirit of the source material (the way that the remastered Star Trek TV series does, and George Lucas doesn't...). I'll even accept creating stereo soundtracks where only mono existed before (so long as I can go back to mono on the DVD back home). But don't claim that all of this is somehow superior to the original when you're delivering it to my eyes in a format much inferior to the original film. It's a thrill to bring back the film to the cinema, and I have no doubt that it would be fun to see the movie in a theater with an enthusiastic crowd. I don't have a ticket, so I won't get to relive the thrills - like the moment when the sepia tones of Kansas give way to the jubilant Technicolor excess of the land of Oz, but maybe I'm better off. All I'd be thinking is that the presentation is at best half of what it would be if it were projected from a newly struck Technicolor film print. At home Blu Ray is going to be great, but in a movie theater I expect a bit more. There's no excuse for marketers to pretend that this version of the film is going to somehow be the best presentation ever when they are delivering inferior digital projection of a compressed video stream. All we can do is click our heels together three times and say "there's no film like film..."
Stunning Sequel To "Don't Copy That Floppy"
A while back, we wrote about "Don't Copy That Floppy", a 1992 music video campaign aimed to teach "the youth" that it's wrong to copy computer software. Their approach uniquely centered on the growing software industry, and how it was jeopardized by rampant piracy. The video seemed to me to be a bit out of touch with pop culture of the time, and came off so whiney that I couldn't imagine it having any possible effect on its intended audience. Fortunately a VHS copy found its way to the internet, and DP's message could hit a wider audience than he could have ever imagined. A new video from the same crew (I use the 90's lingo for "posse" deliberately) just hit the internet. It stars the same ebullient rapper from the earlier opus, but tougher now. The message is similar, with more emphasis on criminal aspects of software copying. The video opens with college aged kids laughing at a rerun of "Don't Copy the Floppy" on television (they must be watching "Totally Chill PSA's" on VH1). Maybe it's the film school teacher in me, but it feels pretty dangerous to undermine the authority of your new project by poking fun at your famously ridiculous prior work. There was a moment in the 1980s when the idea of spending $500 on a dot matrix printer seemed perfectly rational. Even Apple sold one. Back then, computers were all about word processing, programming, grainy girly pics and games - not necessarily in that order. There were no digital photos to print, nor did the idea of printing a CD cross anyone's mind. Fast-forward a quarter century and dot matrix printers are as common as steam-powered cars. I own a laser printer (the cheapest way to print large documents) and an ink jet (for pretty pictures). But the idea of whacking little pins into a ribbon at 80 characters per second seems absolutely barbaric. 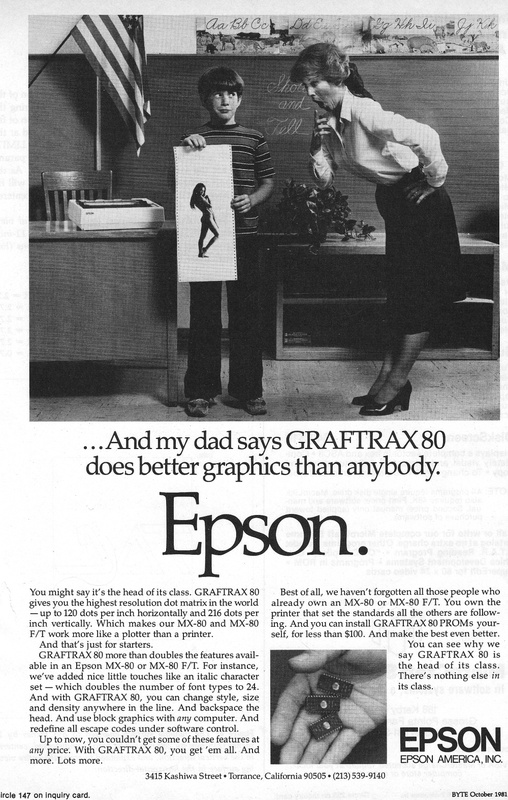 Oddly enough, I'm considering buying one - a tank-like Epson MX-80, perhaps. They were so common that you can still buy new ribbons. More to the point, they work with the prehistoric multi-part tractor feed forms that the (Canadian) post office insists I use to send packages overseas. There are numerous online stores that will sell me a shiny new dot matrix for a couple of hundred bucks, but that seems silly. I'll wait until I spot a nice one for $5 at a thrift store or garage sale. I shouldn't have much trouble connecting a 25-year-old printer to my almost new PC so my neighbors can enjoy its melodious mechanical grind from across the street. Heck, maybe I'll even make some music with the thing. This Canon 814 Auto Zoom Super 8 camera belonged to legendary Swedish film director Ingmar Bergman. It hits the auction block on September 28, 2009, along with dozens of other items from his estate. The camera is nothing special, but wouldn't you love to see the home movies he shot? They're probably fairly normal stuff, except for uncle Olaf's awkward habit of dressing up as the grim reaper and cutting the roast beef with a scythe. All kidding aside, film buffs might be interested in the set of 31 chess pieces that look suspiciously like those featured in The Seventh Seal. Poetically, the white king is missing. The Canon 814 camera is expected to fetch between € 150 and € 200, including a leather case and Linhof tripod. Absentee bids are accepted for those unable to attend the auction at Bukowski's in Stockholm. Other movie cameras and projectors are up for bids, including a complete Arriflex set.